Those who know me well know that one of my great loves in life is the gummy bear, that most amazing of creatures. I’ve told my husband that we have enjoyed a long and fruitful marriage because he does not covet my gummies. I’m not a selfish person, but you really shouldn’t ask me to share. My aunt works at Neiman Marcus. They used to sell gummy bears by the pound – a pretty pricey pound, but those were some serious gummy bears. At Christmas they sometimes still sell bags of them. My aunt gave me a bag a couple of years ago. Even with her discount, we calculated that she paid an outrageous price for them. I rationed myself and only ate them 2-3 at a time, savoring each one. Clayton found my stash and ate the whole lot. Amazingly, he’s still with us. My all-time favorite are Amazin’ Fruit gummy bears. They are a Hershey’s product, but for some reason are almost impossible to find. You can order them online from various drug and candy stores, but I haven’t gotten quite that desperate yet. The ones at Wal-Mart are pretty good and even have real fruit juice, which would remove some of the guilt factor, assuming I felt guilty about eating them in the first place. One Easter there were small bags of Amazin’ Fruit gummies in the Easter baskets. One child said they knew there really was an Easter Bunny because Mommy would never give away gummy bears. Golden Corral has great gummies in their dessert bar. Whenever we’re there, one of my kids (usually whoever is in most need of brownie points) will bring me a little bowl of them. 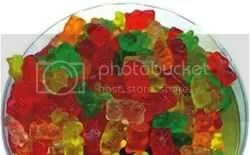 In my gummy research, I read that at the end of a meal at Michaelangelo’s Restaurant Cafe in San Francisco, guests are given a communal bowl of gummy bears. What an innovative idea! The most bizarre thing I learned is that the consistency of gummy bears has been proposed as ideal for breast implants. “Gummy Bear breast implants” have been on the market since 2005. That may be the only form of gummy bears I’m not willing to try.